We marvel at birds for a wide variety of reasons: colorful plumage, melodious songs, intriguing behavior, canny adaptations, and so on. But perhaps most salient among those reasons is birds’ ability to transport themselves across the landscape. Many birds awe us with their seasonal migrations, which may span continents and oceans and challenge our notions of what’s possible in terms of navigation, endurance and site fidelity. When we pay attention to where birds go and why they travel, we often learn things about the wider world. Birds are harbingers of change—in season, climate, habitat suitability—and we can track those changes through their peregrinations, near and far. As natural landscapes give way to human development, many native bird species lose prime habitat or shift their ranges elsewhere (if they can). Some birds, however, seem able to take advantage of the changes and instead ­expand their normal range. Consider the relatively recent arrival of California scrub jays (Aphelocoma californica) in southeast Oregon. While common west of the Cascades in Oregon and Sierra Nevada in California, this crestless, gray-and-blue jay was formerly scarce east of the mountains. Prior to 1990, California scrub jays were recorded just a handful of times in southeast Oregon. Today they are increasingly numerous here and in other places once outside their historic range; records indicate that these jays have been colonizing areas north and east of their range for the past 40 years. California scrub jays aren’t considered a migratory species. When local populations of these birds reach a carrying capacity of sorts, the jays will often disperse en masse, particularly in fall. It’s likely during these periods of dispersal that scrub jays have expanded their range in recent decades. Like other native bird species such as grackles, blackbirds, ravens and crows, California scrub jays have adapted to living alongside human development—taking advantage of feeders, dumpsters and other human-made food sources—and this probably aids in their range expansion. As dispersing birds radiate out to seek less-crowded digs, with a bit of luck they might happen upon an area of concentrated food sources, such as a town or outpost. (They may also deliberately seek such places out.) If the jays can successfully compete with local birds for food and avoid mortality by predators or inclement weather, they could establish a new population. 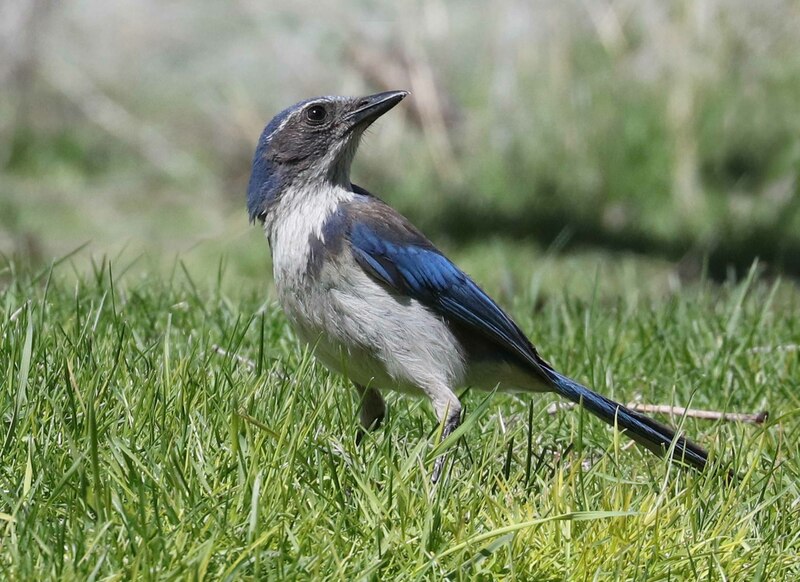 In Harney County, birders began reporting California scrub jays in the towns of Burns and Hines around 2001. That year, the Christmas Bird Count turned up exactly one jay. Since then, CBCs in Burns/Hines have noted an overall increase in jays, with 16 seen in 2016, 40 in 2017, and an all-time high of 54 in 2018. Many residents in Burns and Hines set out feed for wild birds; the scrub jays apparently find this to their liking and have settled in for the long haul.